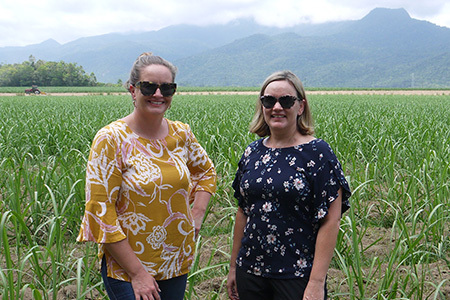 Colleagues, recreational users of the Reef and water quality modelling scientists, Louise and Gill answer some tricky questions from farmers and residents in the Reef catchment. Introduction: The Great Barrier Reef needs to be fighting fit to cope with climate change. While the world takes action to address climate change, improving water quality is the best thing we can do to increase the Reef’s resilience. Runoff from the neighbouring catchment can cause all sorts of problems when pollutants and end up in delicately balanced reef ecosystems. In this podcast series we talk to farmers, scientists, extension officers and local experts to hear their water quality perspectives. In this episode water quality modelling scientists Gillian McCloskey and Louise Hateley have a go at answering commonly asked questions from farmers and residents in the Reef catchment. Gill: My name's Gillian McCloskey. I'm a senior catchment modeller with the Department of Natural Resources Mines and Energy and I run the Cape York catchment model. Louise: Louise Hateley, also work for the same department again Senior Catchment Modeller and I am responsible for the Wet Tropics Model. Louise: Our agenda. OK, do you want to go first? Gill: Sure, I guess for me my agenda is I'm interested in the long-term health and resilience of the Great Barrier Reef. I'm a recreational user of it as well. But I'd like to see land management practices in such a manner that we're having less impact on the Reef. But farmers and landholders still having a sustainable practice for their own benefit. Louise: My agenda is just essentially and has been for a very long time about the protection of the environment and making sure that it's going to be protected and preserved for many years to come. Gill: For me it's about sustainable management for everyone. So it's about sustainable management for the landscape so that it can exist in its best possible condition. It's for me about I've got a couple of kids. It's for them going out to enjoy the Reef, going hiking in the rainforests. But it's also about industry in our region as well and that they've got a sustainable industry here, that they can still live and thrive off the landscape. So for me it's got to capture all of those sorts of sectors of the community. Louise: Essentially trying to be pretty selfless and again just trying to do it so that we can maintain these beautiful landscapes and clean and healthy waterways and forests. It's pretty simple to be honest. Gill: How does your science help my farm? Louise: Okay so all right I'll start, have a crack. In terms of us and what we do as modellers we’re essentially you know we collect as much data as we can from as many places as we can across the landscape but at times that can cost a lot of money and be very labour intensive. So by collecting as much monitoring data as we can we can then feed that into the best available science and model to then help to capture everybody's farm and all of the landscape in the Wet Tropics for example and combine it into a framework that allows us to help identify where there might be potential hotspots in the landscape for soil, nutrient or pesticide loss. Gill: I think our science as well can help give people sometimes a broader understanding of where their farm might sit in the broader landscape as well so we can run things at a sub catchment scale. We can give people an understanding of what their practices on farm are how that might be contributing to pollutant run off to the Great Barrier Reef and we're able to run through with some scenarios about changing management practices that show people that if they switch from practice X to practice Y that can actually have an improved lesser runoff lesser pollutant runoff to the Reef. But it might still generate the same yield from their sugar cane for example. So I think our modelling can really help people understand where their where their farm sits in the landscape. Gill: Some of our modelling the reason we do modelling is because it's too expensive, time and money to monitor everywhere. So we use modelling to extrapolate where there's monitored data and one product I guess the government is developing it's called ‘The Calculator’, it might have another name in the future but effectively it uses some of our modelled data in the background and farmers will actually be able to use an app as I understand it or on their PC, plug in their location, their lot on plan and all of the modelled sort of data that we're using in the background will come up in the background and they'll be able to do different things like change their fertiliser application right and then see what impact that will have on both yield and runoff as well. So our modelled data is used in the background of that both the catchment and the paddock scale data is used in the background that's probably one example. Louise: And there's also been field trials. We've got one in sugarcane at the moment at Silkwood and we've had a banana trial in South Johnson where they've compared practices and shown the water quality benefit from practice A versus practice B, so to speak. So we do have data to show you know the farmers for particular practices how they can improve water quality. Louise: No one has been able to explain to me what modelling is, can you? Louise: I will have a crack. This just came to me yesterday actually. So I thought to myself how do I explain modelling you know. Friends ask me ‘what do you?’ for example. And I go ‘crikey I don't know how to answer this question’. All right. So I will have a go and say basically think of me like I'm a climate forecaster. You know I like those weather people. They kind of predict the weather like I say. But instead of predicting how much rain will fall I will work out once the rain hits the land surface how much of it will run off to the nearby creeks and rivers and then how much pollutants it will carry with it. So I basically look at once the rain hits land surface how much run-off happens into the local creeks and waterways and what is basically carried with that water. So maybe it might be soil it might be nutrients from fertiliser or pesticides for example. So that's kind of in a nutshell how I sort of describe the modelling and the other way I thought about describing the other day was think of like monitoring on, so we'll go out we'll test the water and we'll collect water samples for example and let's just say that the water quality monitoring samples are a bunch of black dots on a page and these bunch of dots on a page don't really look like anything. But once you actually join the dots together and make a picture I kind of that could be another way to describe modelling. So modelling is drawing those dots together to form a particular picture. So without the dots you can't have the modelling and without that the lines but drawing the dots together you don't really have a picture of what's going on. Gill: Modelling is a tool that allows us to extrapolate information through space and time and we collect a lot of data through monitoring but they're often at discrete locations and it's difficult to untangle I guess all the factors of why a pollutant level might be what it is by just taking one sample. So we take lots of samples but then we're able to use a model to extrapolate and put in different input datasets that that might have an impact on that. So land use is one, soils data is another, rainfall those type of inputs so to me modelling is a really useful tool to extrapolate and untangle the story I guess. The point of our project is to model what effect land use practice change has on pollutant load. You can't just measure that because there's so many inputs but a model with a model we're able to do that. There’s so many things that people use modelling daily for. They probably don't think anything of it. You know even back of your envelope type calculations if I put this much in the bank and I use a bank calculator that tells me what my repayments are going to be on my home loan. That's modelling. It's using numbers and different input datasets to come up with an answer. Louise: And essentially modelling is just a representation of reality. It's really all it is. A collection of equations built into a piece of software. It's just a representation of reality. And one line of evidence and we clearly rely heavily on the monitoring data as our points of truth to help guide the model. When we first started maybe 10 years ago there were 20 sites maybe and we're up now into the 60 and 70 number of sites. We're also moving into the real time nitrogen sensing probes that have been put into some key locations throughout the GBR and a significant increase in the amount of monitoring that's been going on in the last 10 years. Gill: That is a by-product of the modelling as well so the monitoring can inform modelling so we obviously use monitored data to help validate and calibrate our models. However, the modelling data can also inform the monitoring to say oh we really need some more information from this spot. We are not sure about the numbers in the model for this location. Therefore, the monitoring can inform the modelling and so I would be great if we could have a monitoring site over here. So the two programs really work together really well they both inform each other. Louise: What is a catchment load? That's a very good question. Louise: All right. So let's just talk about the definition what is a catchment first. I think that's a good idea and the way I've described to people what is a catchment is think of a bowl you know your cereal bowl in the morning and it has a rim around it right at the very top. And essentially you're going to pour milk and maybe some rice bubbles into your bowl and essentially everything you pour into the bowl will stay in the bowl and you can think of that as your catchment. Anything outside the bowl falls into a different catchment. Well clearly is going to fall on the table really and make a mess everywhere. But anything that falls in the bowl is your catchment so you can think of when the rainfall hits the landscape it's going to fall into a catchment that's basically an area that catches water and then will eventually flow either cross the landscape or percolate down through the soil profile and eventually probably end up in a creek or stream like this and then end up draining into the Great Barrier Reef. So catchments can range in size. In the Wet Tropics we have what we call eight major basins and then you can obviously have sub catchments within those particular basins or larger catchments. Gill: A catchment load might be the estimate of for us we're primarily interested in sediment so we might measure sediment in kilotonnes per year coming out of a system. Different nutrients dissolved in particulate nutrients. Particulates are attached to sediment we usually measure those in tonnes per year. So it's an estimate of how much of that in tonnes per year is coming out to the Reef and we also measure pesticides which are typically measured in kilograms per year. So it's effectively a measure of how much pollutant is going out to the reef. Louise: Why do you think farmers question the science? Gill: Yeah this is a tough one. I think a lot of the problem is that for farmers and not just farmers, other scientists, community, the model is not something they can touch or see or see how it's operating. It's numbers, its equations in a computer system. We hit some buttons and off it goes and it is those things but the numbers and the input data sets to the model are real things and I think it's difficult to get people to understand what those numbers and the input data sets mean because they can't touch and see what the model is. And even if you showed someone the model it's really complex. It's a really complex system that we use but I think that's my main view is that it's just not something you can touch. Louise: And because we're working in these catchment models and it took pretty much a year to build from start to when you can run some kind of model with some level of confidence to say no. So it's huge amount of data that goes in and computing power required to run these models. I find too that sometimes it's very challenging to explain modelling in a really simplified language. You get to a point where it kind of loses its meaning in a sense. There's a real challenge to simplify modelling as best as possible but not to the point where you're actually losing its really important meaning and context. So extremely challenging. I get why the farmers. I understand that they think we probably just sit in our air-conditioned offices all day every day and have no idea about actually what's happening in the real world what's happening on their farm so to speak. Gill: It's hard to explain for example that we spent six months just getting the hydrology right in our models so it rains it runs off it goes out to the to the sea. We literally spent six months getting that right in the model because that's the most important part of the model because that generates pollutants and that's how they run out to the sea. But it's really difficult to explain that yeah we sat at our computer and got that bit right and spent six months on it. But that's how long it took. And we still work on that now even though we spent that time years ago doing that. We're still updating that as well so that sort of thing is really hard to communicate the complexity. Louise: And to be honest I've gone out many times and I talk to farmers and maybe we could gain better skills at communication so there’s a lot on our part I think for us to be able to move forward to build the trust between the modellers and the farmers out there. I think we could still do that but to be honest I've been working with Terrain over the last 10 years and some of the sugar cane farmers working for Terrain have just come around to me in the last couple of years. So it's taken a really long time to build that trust and I've finally got it. And it's a long process. I don't know if I have all the answers about how to do that but I guess at the end point too is just so that they know that we're using the best available science with as much real data as possible using the best available yes systems and software and models that we have at this present time. Gill: Generally all of us the community so scientists, farmers land, managers wherever they're from I think I think we are all working towards the same end goal. I hope we’re all working towards the same end goal which is to limit or even reduce our impact on the Great Barrier Reef. A lot of people in this region will use the reef recreationally. Louise and I go hiking through the rainforest. I think we'd all like to see the land managed in a really sustainable way so that we can reduce our footprint. Our impact on the health of the Reef. Louise: I'm still really chuffed that the progress we've made in 10 years and the massive amount of people that have come together to work on this program and what we've been able to achieve in 10 years is actually being quite outstanding. And we've had some international reviewers comment and say that it's an internationally significant project and personally I feel very fortunate to be able to do this in far north Queensland. And yeah I've just been given the opportunity to work on it especially in the Wet Tropics it's such an important issue considering it's such a wet environment but yeah I feel very privileged. Gill: Yeah I'd totally agree. It's being described as world leading science particularly the way the different components of the program come together so that the paddock monitoring and modelling, the catchment modelling and monitoring, all of those programs we're all separate little teams we all come together a lot. I think that's resulted in a really good product and I do feel like we're helping save the Reef. I use the Reef, we both use the reef a lot. So to go out there and see it and then know that you come back to the office and you're working towards its long term health is pretty cool.